Riverside Farm Wedding Photos are taken at the country’s most exclusive wedding venue. The venue, located in Pittsfield, caters its events with food and resources produced locally in Vermont. The farm is an authentic, working Vermont farm, with over 700 acres of land and six beautifully restored barns. Barn receptions have a rustic, country elegance and each wedding is unique to the bride and groom. Riverside Farm Wedding Photos are something couples will cherish for a lifetime. This photo shows the groom as he prepares for the wedding ceremony. He and the bride had decided on a summer wedding, so the couple and guests were often found outside amidst the charming scenery of the farm. 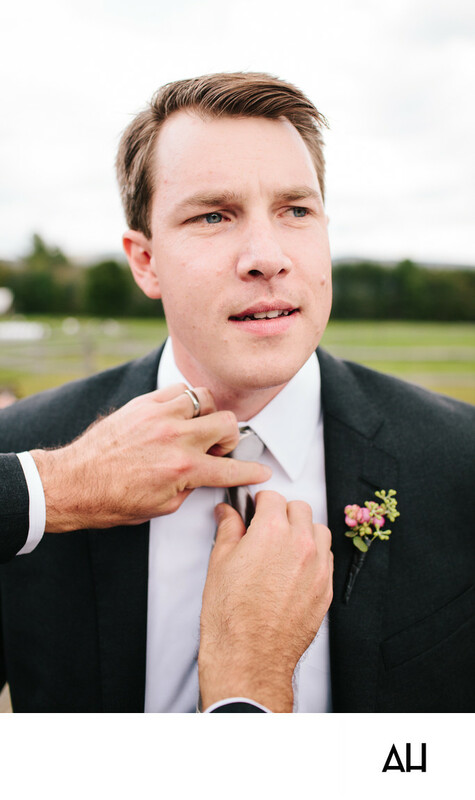 In the image, the groom looks into the distance, lost in thought, as his father straightens his tie before the wedding ceremony. He wears a classic black suit and a neutral colored tie, with a spring of tiny pink flowers as a boutonniere. The look on his face is one of happy bewilderment. The groom is full of wonder as he thinks of the moments that are to come -- from he and his wife saying their vows, to the magical first days of their marriage, and beyond.